This week I updated the instructions for my Reversible Shoulder Bag pattern I first posted in August and I created a photo tutorial (below). I love how this bag is both casual and streamlined at the same time. It's put together with only four pieces of fabric and should be easy enough for an advanced beginner to complete. The finished size is 27 inches tall and 35 inches around. UPDATE: PLEASE GO TO MY NEW SITE TO DOWNLOAD THE PDF PATTERN AND INSTRUCTIONS. Step 1: Create your pattern. Use the diagram in the pdf instructions, to draw the pattern on large paper. Or, print the pattern from the tiled pdf. 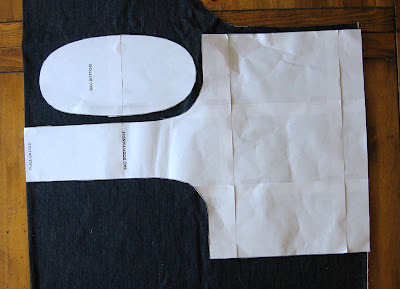 Assemble the pattern (read how to do it here). 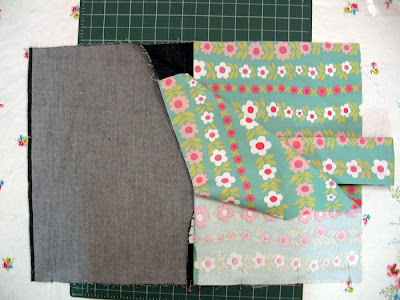 Step 2: Arrange the pattern on your fabric. 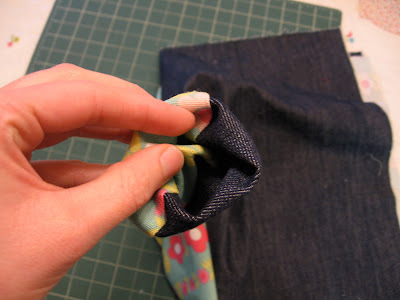 Tip: If you are short on fabric, make a seam at the top of the handle instead of placing it on the fold. 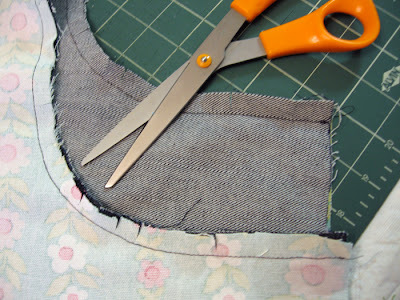 Before continuing, cut the handle 1/2 inch longer and stitch together. Cut one each of bag body and bottom from fabric A and fabric B. You now have four total pieces. Step 3: Pin body of fabric A to body of fabric B, right sides together, along curved edges and handle. 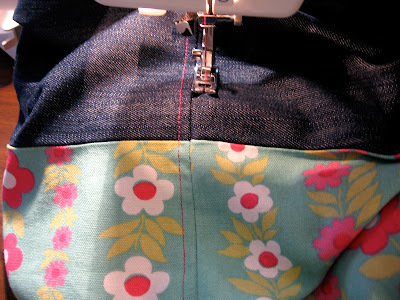 Stitch using a 1/2 inch seam allowance, leaving sides open. Step 4: Clip the curved edge. Turn right side out through the handle. Step 5: You can now see the bag starting to take shape. This is a good time to press the handle of the bag. Open the bag so the wrong side is facing and the handle is in the middle. Press the seams open a few inches. Next, stitch the side seams. With right sides together, match seams and fabrics and stitch using a 1/2 inch seam allowance. Step 6: Press seams open. 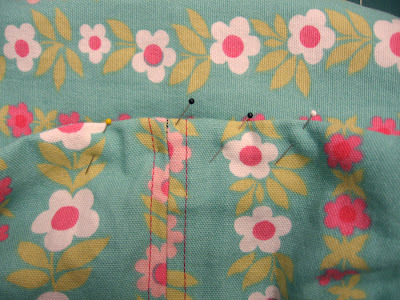 Topstitch on each side of the side seams, stitching only through the body of the bag and the seam allowance. Step 7: Place pins or clip at center of each side of bag and at each end of bottom piece. (To find the centers of the bottom piece, fold in half lengthwise and widthwise.) Baste around bottoms of bag body. 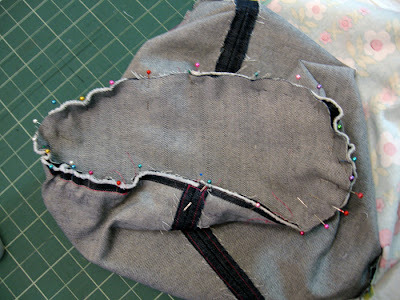 With right sides together, align center of long edge of Fabric A bottom piece with the side seam of Fabric A bag and pin. Match pins at short end of bottom piece with pins bag centers. Step 8: Pull basting stitches on bag body to gather along short ends of bag bottom. Pin in place. Stitch using a 1/2 inch seam allowance. Repeat for the fabric B side of bag, leaving an opening next to a side seam about four inches long. Step 9: Pull the bag right side out through the opening in the bottom of fabric B bag. Stitch the opening closed by hand. Step 10: Press where necessary and topstitch around curved edges and handle. I'd love to hear questions or comments about the pattern. And if you make one I'd love to see pictures. If you don't feel like making one yourself, I'm thinking about making some to sell on etsy. I'll post about it when the time comes. I've been thinking of making a little bag for a while. One I could fold and carry everywhere in case of need. One like this... Thanks for the tutorial. So cute and simple to do. The choice of fabrics is only limited by the type of care they require. This bag would be a great for the beach. I had a thought as I was looking at the pattern. You could add decorative rings on each side to clip keys, phone, etc. I would put the rings about halfway up from the bottom of the bag since whatever is clipped has a tendency to drag down the fabric. Thanks for sharing your talent. Thanks for the tutorial! I will be making one of these...so cute and your instructions seem very thorough...love your blog. Neat! I need to make a couple of these to keep on hand. Thanks for the pattern! i was wondering if you would be able to tell me the size of the pattern pieces as i don't have a computer and would have to draft my own. this is a fabulous bag! Hi there! Thanks for visiting everyone and for the compliments! d+r: There is a diagram for drawing your own pattern on the last page of the instructions pdf. You'll find the link under the Downloads header towards the top of the post. The diagram gives dimensions in inches. 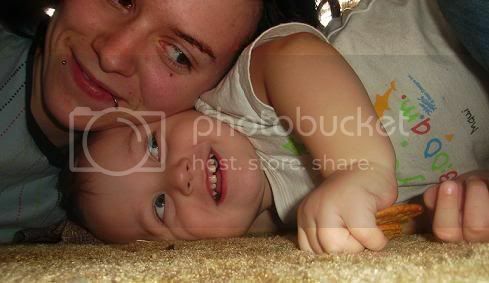 this is adorable!!! (: can't wait to [try] to make it!! thank you soooooo much for this tutorial! Oh, I love this! I'm so making myself one as soon as I get a break from work. :) Great tutorial, thanks for posting!! Thanks for the great bag pattern! I made one last week and it's fantastic. Instead of top stitching the side seam, I stitched some ribbon over it (to hide my crooked sewing ...). So cool, I need to make one myself STAT!!! I just finished the bag minutes ago. I LOVE IT!!! Thank you so much for the great pattern and detailed instructions. I'm definitely going to make another one soon. I finished my bag this weekend. It's my vacation beach bag and I love it. I'm getting ready to make another. Thanks so much for sharing! Thank you!! This will be the first bag I ever make...! I am stuck on step 6. How do I top stitch the sides of them hem? when they get small near the curve. I don't know if I make sense I am stuck... sorry. Hi Katie- I'm so sorry you're stuck! Step 6 is mostly for decorative effect so don't worry if you can't figure it out. But I'll try to explain. In Step 5 you stitched the side seams. In Step 6 you're going to stitch down those seam allowances. There aren't any curves on these seams. These are the straight up and down ones. The curved seams around the handle are top stitched at the very end. I hope this helps! I had done step 5 wrong.... I had sewed the opposite fabrics together and so I tore it out and fixed it and then got step 6! :) yea. This was my first sewing project since home ec (in 7th grade) and I am 24, I am super excited and love my new purse. I just have to finish the hole from turning it. Do you have a flickr group yet??? Thanks for the instructions and your help. I'm so glad it worked out! Congratulations! There isn't a flickr group but that's a good idea. I'm flattered actually. I'll post about it if/when I start one. I made 2 more purses for my sisters and a lunch bag off the purl bee site and a new ironing board cover! What a productive holiday weekend. Hope you have a good trip! I made your bag model in about 12 hours.. I've just finished testing it on everyday life and I find it very beautiful and comfortable! Really Thanks for your sharing!! I hope I posted that link correctly. This is a gift for my sis in New York. Wonderful project, easy tutorial, great outcome. Can't recommend enough. Thank you so much for going to the trouble of posting a tutorial and pattern pdf! Very nice bag! Thanks for sharing the instructions. I have a bag almost identical to this (that I absolutely love) that I received as a gift from my cousin. I love it so much that the seam at the top of the handle has started to tear. 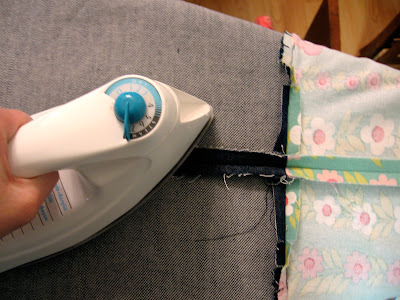 Do you have any recommendations for how to re-sew that part without having to pull the whole bag apart? If the fabric around the seam is not too frayed, I would do an invisible slip stitch along the folded edges. If the fabric is really falling apart maybe do a patch? A patch might reinforce that area from future wear. In general to avoid taking it all apart, try to fold raw edges inside and then sew along the folded edges by hand or machine. Very cute!! I have a vision of a dark denim shoulder bag with red wallpaper print lining and red topstitching. How cute would that be?! I plan to make one of these soon. Thanks for the tute! 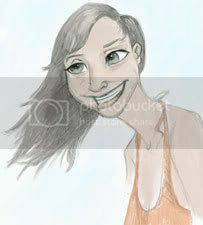 My name is Holly Cazabon of Artella, an online playground for writers, artists, and creative spirits. I wanted to let you know that we featured your Web site in our LinkLatte™ newsletter on April 4, 2008. LinkLatte is a fun little gift we send each morning to our extensive member mailing list, which also appears in our daily creativity newspaper, The Artella Daily News (http://www.artelladailymuse.com). Through our various programs, Artella reaches over 50,000 people monthly, and has been lauded by several leading art, writing, and spiritual publications. If you think that your audience would be interested in Artella, we would be so happy if you’d consider placing a reciprocal link to us. Thanks for having such an inspiring and creative site! Beginner here... Was it hard to pull the fabric through the handle? Especially with the Denim? or was there enough give room? I am totally loving this bag! I just finished this bag, and I love it. If I make it again though, I'll probably add about an inch or so to the strap, it's a little shorter than I like my shoulder straps. Other than that, an awesome pattern! This is an amazing bag for a mom! 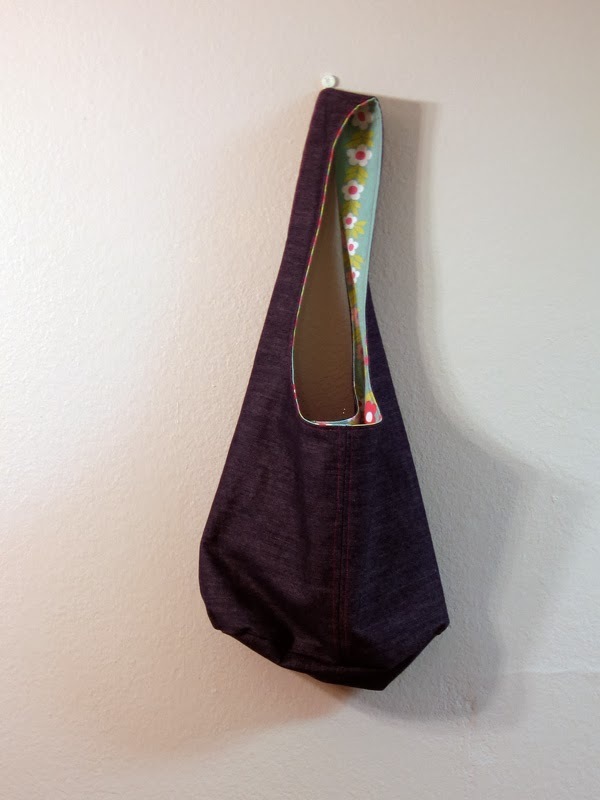 I made one for a friend and she loves that she can use it as a purse and throw in a diaper, wipes and a camera as she goes out the door with her daughter and she is all set! We are going away for the weekend with our 5 month old and I'm making one for myself so that I don't have to carry around a diaper bag all weekend. I'm stuck at step 7. I can't seem to get how to connect the bottom to the bag. Let's see if I can help with step 7. 1. You have two bottom pieces and two sections of the bag. Start with the bag right side of fabric facing. It looks almost done except for those raw edges at the bottom. 2. Next lift the bottom edge of one section so that the bag is inside out. The handle is in the middle between the two sections. It just stays there. At this point it might seem like you're going backwards. 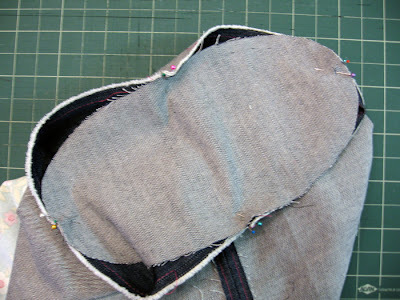 You're going to sew the bottoms to each side separately and then turn the bag right side out. 3. To make the bag fit the slightly smaller bottom, you'll need to gather two opposite sides of the bag. Stitch long basting stitches around the bottom each side of the bag. 4. Pin the bottom to the bag, matching centers and evenly distributing gathers. 5. Stitch leaving an opening on one side for turning. There's also a pdf with illustrated instructions you can download by clicking the link in the sidebar. If you have more questions you can send me an email me by clicking the "email me" button in the sidebar. Good luck and I hope this helps! fantastic bag - thanks for the pattern. I've just finished mine and am very pleased with it!. I would like to make one for my daughter and her friend . Can you suggest how to scale down to make a smaller size bag? I have had success scaling down this bag proportionally. I think the easiest thing to do is to download the "pdf of instructions & diagram" by clicking the link in the sidebar. The third page of the pdf has a schematic for the pattern. Then scale each of the measurements proportionally to make a smaller size, like when adjusting a cooking recipe. The small bag I have looks about 2/3 the size of the original and it would be considered a mini bag by adult standards. It fits just under my arm and holds the bare minimum of stuff. I'm so glad you like the bag and I hope you have success scaling it down! WOW, thanks for the tutorial! Have been seeing these bags around and wanted to design my own with pockets and such...thanks for your great pattern! Thanks for the great tutorial. 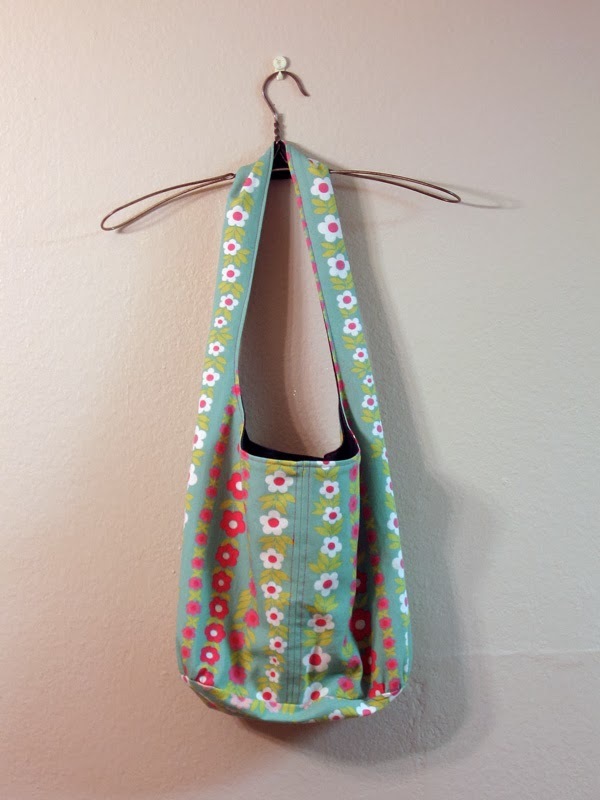 I linked to this from my blog, with pictures of the bag I made today. If you would prefer, I can take the links down. Just loved your blog so much! Link away! I don't have a problem with it at all. I had a good time making this tote! Not hard at all. I'm going to make the next one with 4 different vintage sheets. I made this bag today!! its easy and beautiful! Thanks! I love your tutorial. I have made many of these bags. They're so quick and easy. I hope you dint mind if I put a link to your tutorial on my page. Thank you for this clear tutorial. I love this bag. Hope you don't mind that I put a link on my weblog. Hello! I made this bag and it's great! Thanks for sharing it with us. I'm trying to reach you to request permission to link to your tutorial (and share a photo) for our upcoming Handmade Holidays on the Sew,Mama,Sew! blog. I couldn't find your contact information (though it is late!). Would you mind emailing so I can give you the details? We love your project and would like to share it with our readers. This bag is fantastic!!!!!!! I have only been sewing for 3 days and I am having success with this bag! I LOVE the size as most purses have too short of handles. This is only my fourth sewing project ever and it is looking fantastic! Hi Courtney, congratulations! Good luck with your future sewing endeavors! Maddy, I'm sorry that you had trouble. It sounds like it might have been step 8 that you found confusing. I probably should have said something like, "Pull the bobbin thread from the long basting stitches to create gathers and fit the bag body to the bag bottom." Making gathers can take some practice. A beginning sewing book should help explain the process. It's Batman and I added pockets. Love that it's reversible! love the floral pattern & simplicity! I just finished my first bag. Thank you for fantastic design and instructions! Thanx for sharing your passion with us! Thx for sharing the pattern with us! I finished my bag and added 2 things, a pouch on the handle to put cell phone or ipod. I also added a large divided pouch to one side to put a book, water bottle etc. when reversed the pouch is on the inside. I was going to add a place to put a ring for keys but forgot to do it when stitching up the sides. Hi. Does anyone have the approximate measurements for the two different sizes of bags? We are totally confused. You say it is only 4 pieces . Are there 4 pieces for each type of material? Also, the bottom seems too big for the bag body! We are beginners, so please help! The finished size of the large bag is 27 inches tall and 35 inches around. The finished size of the small bag is roughly 16 inches tall and 20 inches around. There are four pieces total for this bag (two of each fabric). Once the sides of the body are sewn together, the bottom is actually smaller than the body. I hope this gets you started. Thanks! The bag was really good! Would love to make this bag for the holidays and would love to include a link on my own blog if that's ok.
Can't wait to try. Have added it to my personal crafting to do list on my blog. Love this tutorial. I hope you don't mind that I included a link (with picture) from my site. 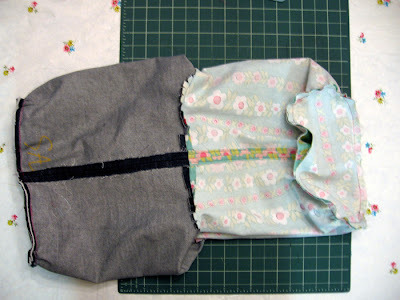 I have bookmarked this tutorial in the hopes that I become a confident enough sewer to tackle this super cute bag. I love it!! i just want to ask that what is the best fabric to use? i dont know any shops around here which would do fabrics so i will use what i find at the house like old blazers, coats, jeans, tops etc..
i also want to aks that would this bag be large enough for a school book of an A4 size for example? oh...and also would the straps be long enough to have it over the shoulders but across the chest kinda way if you know what i mean..? omg sorry for all that questions thanx.. I recommend most any woven fabric that won't stretch (not knits). Yes, it should be big enough for A4 size books. The strap is long enough to sling over the shoulder and across the chest, but is a little tight worn that way. This is such a cute bag, and just what I've been looking for!! Adorable fabric, too. :) I'm off to make one now! Wow, I NEVER post comments, but this bag was so fantastic that I had to thank you. My sister saw it (via Skype) and now I have to make one for her! I actually am a quilter and not a sewer, but it went together easily and I even stuck a little batting in and quilted the bottom in the end so it will be a little 'sturdier' down there. Thanks again for taking the time to share this with us. My granddaughter found a similar bag in an expensive boutique. I told her if I couldn't make her one she liked even better, I would buy her the one in the shop. Now I am making them for all her friends. Thanks so much for making me a hit with my granddaugherr. My purse I originally made a year and a half ago is finally starting to fall apart, so I will be making myself a new one after the one I have in progress. Thanks for the heads up Courtney! The links should be working now. I'm really glad that you like the pattern and have put it to good use! i really like the bag and the pattern was great! if i could change one thing it would be to make the handle an inch or so thinner. Thank you for this wonderfully detailed tutorial. Tha pattern is important but to me what is great is the step by step explanation because it's not at all obvious how one should proceed to make the bag. thanks!!!! your are the best! i have being serching for this for a lot of time! thanks for a great tutorial. just finished a cute bag for my niece -- the first name checked off my xmas list! :) Thank you so much for this ... love it, I have added a pocket for my mobile on one side and a small pouch on the other - so it is no longer reversible, but looks awesome. Awewsome bag! After little projects, this was the first bag I made, and I looooove it!! I added a pocket on each side before sewing the bag together so now it's still reversible but with a pocket inside and one outside, always! I love it! Thanks for the great tutorial and the tiled pattern, that way it was very easy for beginners like me! let me just start by saying that you caused me a BIG headache! I am a advanced beginner and was very lost when you said there was only 4 fabric pieces needed when in reality there was 6. I had to ask several of my friends to make sure that i was not going crazy. You really need to say that you need 6 pieces because it just doesn't make sense if you don't say that. Just saying, i was pissed. and i am not a hater. i loved the bag, it was ADORABLE!!!!! Thank you very much for the patterns, no one else has a tutorial for this kind of bag. Just change the instructions and it will be amazing! To: Anonymous with question regarding 4 vs 6 pieces for the pattern. I have made this bag quite a number of times with only 4 pieces. I've thought about your question and believe the confusion might be in the pattern layout. The bag is designed to have the top of the handle cut on the fold (resulting in 4 pieces). 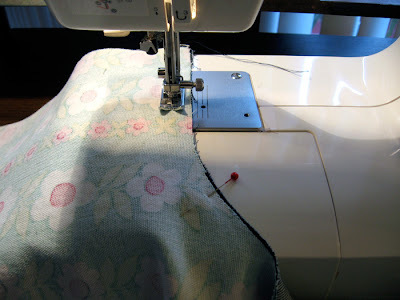 If the body of the bag is not cut on the fold, there will be 6 pieces (4 main body, 2 bottom) and you will need to make a seam at the top of the handle (see step 2). 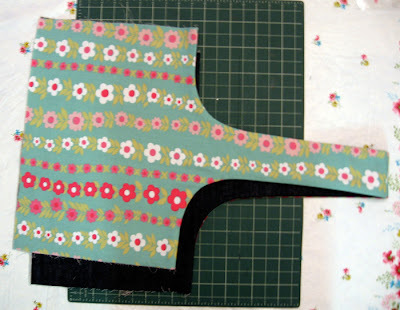 Another way you might end up with 6 pieces cut out is if you cut 2 of the bottom piece for each fabric. (Total 2 main body and 4 bottoms) In this case, you can discard the extra 2 bottom pieces. Your work is wonderful! Absolutely love it! I love this bag so far! I am stuck on step 5 though. I can't figure out what I should be stitching. Is it sewing the matching sides each to the other? I don't know how to explain it. Do you have any tips on step 5? 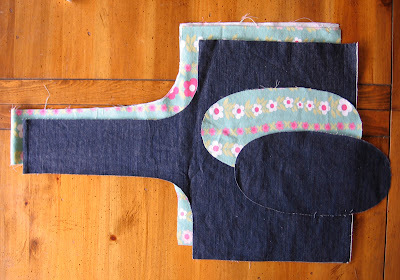 Hi Sarah, Yes for step 5 you are sewing the matching sides together. Take a look at the pdf instructions (link in sidebar) for a drawing of where to stitch. Best of luck! this is sooo awesome a pattern like this was sooo hard to find i've been wanting one of these bags for the longest me and my sister searched everywhere and one day she went online and found this your truly awesome and the bag instructions are sooo easy to follow and it's not sloppy the bag came out nice and neat your a pattern and sewing god keep up the great work!!!! Hi There. Greatings from Denmark. I´ve just tried out your tutorial and it worked out great. I've made a link from my blog together with pictures. so i am a little confused...on step 3 i don't understand what i am supposed to sew. am i supposed to sew all the way around the bag, just the straps or what? I also don't get on step 4 what clip the curved edges means. if someone could help that would be awesome!! Hi....grettings from germany...this is a fantastic bag...i love to sew it....thanks for the tutorial. Hi there , for som eor other reason I cannot download the pdf. If anybody has it , could they perhaps e-mail it to me? Hi Kate, Send me an email at lulalouise@gmail.com and I can send you the pattern. I had been searching for a pattern for a bag like this for my sister for forever! This bag is perfect I lengthened the strap and my sister has loved and used it so much I am now having to repair it because she cannot live with out it! Im working on making myself one. Love it Thank You!!! Thanks so much for this pattern! I love it. I just made several to send to friends as part of a craft swap. I blogged about it with a couple pictures here. I have been wanting to make a bag like this for so long- what a great surprise to find a pattern in here! Thank you! and it was pretty cool thanks to your tutorial!! Hi, Lula Louise. I have made three bags using your easy to follow pattern and tutorial. It's a great bag! Thank you very much for sharing! I posted a couple of pictures at flickr. This tutorial looks great! Have been wanting to make a bag of that shape. Thanks! I've been admiring my new bag the whole day! Thank you so much for the great tutorial! I just finished the bag and I love it. Even added pockets!!! I was wondering how do you add pockets especially since its reversible? I made the bag tonight for my daughter. I added a small pocket with a flap on each side of the strap ( since it is reversible )for her Ipod.. and I also added a key loop.. again one on each side since the bag is reversible. I will post some photos tomorrow and will link it here. I need to make one for myself now. She also wanted a longer strap so she can wear it across her body. Thank you very much for the tutorial! I just made your bag using a serger.. i skipped the top stitching which i assume is mostly to add strength to the seams.. it was easier than I thought and now I want to make more with slight variations and different fabrics.. maybe adding a pocket or rings. The printable pattern worked very well. Havn't I already shown my versions? Sorry for this delay. I do do do love your pattern! Thank you so much!! This is great! I HIGHLY suggest that you make a tutorial video for it though. This is what I've been looking for! The tutorial was easier to follow than other ones I've seen. Thanks! I just made one last week, it came out great! I made the straps a little longer though (my preference). But the pattern was good and simple. I'm about to make another one for my mother-in-law right now. My sewing skills could be considered absolute beginner, and I just finished this bag. It actually looks pretty good. The tutorial was so easy to follow. Thanks for the pattern. Hiya! First can I say that this tutorial is FAB! I've never used a sewing machine before but I whipped out an old duvet cover, cut it up and whipped a bag up in one night then got ordering some funky fabric the same day. I've just got one question, has anyone managed to attach a zip to the bag? I know it would make it non-reversible but I've been thinking and maybe if you attach two zips if you really wanted to, one for one side and one on the reverse and alternate with which side of the bag you're using. I wan't to make the bag for college and I'm thinking adding a zip would make it more secure and sturdy but I don't know how to. Any help is HIGHLY appreciated. I'm not too bothered about it being reversible as I imagine the inside will end up all minging anyway. Hi there! This is an awesome tutorial! Thank you so much! I finished a bag yesterday and you can have a look at it on my blog: http://pollypuenktchennaeht.blogspot.de/2013/01/schon-stoff-samstag-no-3.html. I wonder if you would mind if I translated the tutorial into German and linked to your instructions and pattern, so my felllow German "sewing addicts" could benefit from your great idea, too ?! I'd love it if you translate the pattern into German. I love the fabric you used for your bag. Thank you!! im so slow and cant get this at all. can you do a video? My strap is twisted! I was good until I put the bottom on. Please help. Great bag - easy to follow instructions! I made a "practice" before I cut into the small piece of fabric my daughter wants for her bag. Question: The fabric she wants to use is a geometric pattern which may not match at the seams. How would I alter the pattern or layout my fabric so that the topstitched seams are aligned on the sides of the bag, rather than the middle of the front and back? THANKS! for any advice. I was wondering why my result of the tiled printout put together was a lot larger than the actual measurements? Hi, I'm wondering if you could possibly make a video tutorial on how to make this also? It would be greatly appreciated. thanks! I am kind of confused with step 3. Do we pin along all the edges, or only the handle and curved edges? Thanks in advance!